Ever since people began grappling with the realization that human activities are changing the climate, scientists and decision-makers have struggled to come up with simple ways to talk about the topic with each other and the public. To help with that challenge, NOAA climate experts created a simple index that answers one of the most frequently asked questions: how much are human-produced greenhouse gases influencing the climate today compared to the past? NOAA’s Annual Greenhouse Gas Index (AGGI) is a yearly report on the combined influence of long-lived greenhouse gases (atmospheric gases that absorb and radiate heat) on Earth’s surface temperature. The index compares the combined warming influence of these gases each year to their influence in 1990, the year that countries who signed the U.N. Kyoto Protocol agreed to use as a benchmark for their efforts to reduce emissions. By the end of 2016, the warming influence of greenhouse gases had risen 40 percent above the 1990 baseline. Explore this interactive graph: Click and drag to display different parts of the graph. To squeeze or stretch the graph in either direction, hold your Shift key down, then click and drag. This graph (source data) shows the combined warming influence of long-lived greenhouse gases as a fraction of their 1990 influence. Like other gases in the atmosphere, including oxygen and nitrogen, greenhouse gases are transparent to incoming sunlight. Unlike those more abundant gases though, greenhouse gases are not transparent to heat (longwave infrared radiation). The sun-warmed surface of Earth radiates heat day and night. Some heat escapes freely to space, but some is absorbed by greenhouse gas molecules. These gas molecules radiate warmth back into their surroundings; thus, they are also known as heat-trapping gases. The natural warming influence of greenhouse gases—the greenhouse effect—keeps Earth’s temperature friendly to life; without greenhouse gases, the planet’s average temperature would be below freezing. Since the onset of the Industrial Revolution, however, human activities, especially burning coal and oil for fuel, have increased the abundance of heat-trapping gases and amplified the greenhouse effect. Earth’s average global temperature is rising as a result. To calculate how much warming we can expect, scientists need to know the combined influence of all greenhouse gases. The answer is complex because each type of greenhouse gas absorbs and releases different amounts of heat energy. Additionally, the amount of each gas in the air is different, and the concentration changes over time and from place to place. (left vertical axis) The heating imbalance in watts per square meter relative to the year 1750 caused by all major human-produced greenhouse gases: carbon dioxide, methane, nitrous oxide, chlorofluorocarbons 11 and 12, and a group of 15 other minor contributors. Today's atmosphere absorbs about 3 extra watts of incoming solar energy over each square meter of Earth's surface. 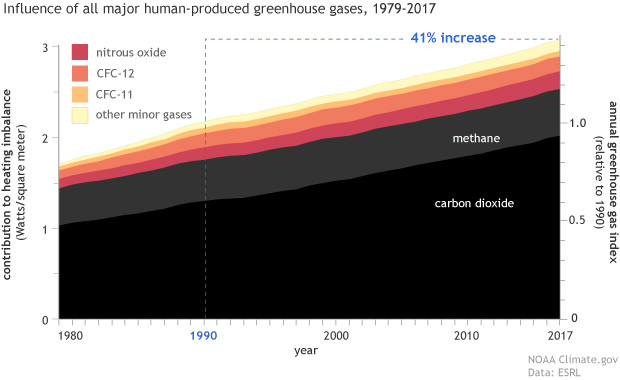 According to NOAA's Annual Greenhouse Gas Index (right axis) the combined heating influence of all major greenhouse gases has increased by 41% relative to 1990. NOAA Climate.gov graph, based on data from NOAA ESRL. Researchers in NOAA’s Global Monitoring Division calculate the AGGI using air samples collected every week at about 100 clean-air sites around the world. Technicians use state-of-the-art instruments to measure the abundance of greenhouse gases. From these observations, the researchers generate a smoothed global average. At the end of the year, the weekly data are combined into an annual average, which is then compared (indexed) to 1990. Indexing each year against 1990 makes it easier to compare one year to another. The year 1990 was chosen as the baseline year because it marked the first time that countries around the world seriously considered how they might work together to reduce emissions of heat-trapping gases. Under the U.N. Kyoto Protocol, many industrialized nations around the world agreed to reduce their collective greenhouse gas emissions by about 5 percent of their 1990 amounts by 2012. Although the goals of this agreement have not been met, the year 1990 remains an important point of reference for efforts to limit greenhouse gas emissions. NOAA researchers are planning to calculate AGGI values back to the year 1750—the onset of the industrial revolution. To accomplish this, they will use data on greenhouse gases concentrations estimated from air bubbles trapped in ice cores, at a network of sites around the globe. Including these historic data in the AGGI will provide a more complete picture of humanity’s long-term influence on climate change. Butler, J. (2010). The NOAA Annual Greenhouse Gas Index (AGGI). Earth System Research Laboratory, Global Monitoring Dvision Website. Accessed July 20, 2017. U.N. Framework Convention on Climate Change. (n.d.) The Kyoto Protocol. Accessed July 20, 2017. The AGGI combines the warming influence of all the main greenhouse gases and compares them to conditions in 1990. Since 1990, the warming influence of all major greenhouse gases has increased by 40%. Beginning with the Industrial Revolution in 1750, it took ~240 years for the AGGI to go from 0 to 1 (to reach 100%), and 26 years for it to increase to 1.4 (another 40%).